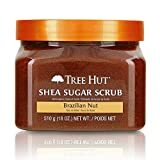 Enjoy this gentle exfoliator, the Tree Hut Shea Sugar Scrub with the amazing scent of Brazilian Nut. Tree Hut Sugar Scrubs are infused with Certified Shea Butter, and an array of natural oils, including Evening Primrose, Safflower Seed, Sweet Almond, Avocado, and Orange Oil. This scrub provides intense exfoliation AND moisturization, leaving your feeling soft and smooth while providing powerful hydration.